Marketing is nothing if not creative, and that creativity can lead to some amusing (and surprising) marketing moments. In some cases, we’re floored by how much an advertisement was able to emotionally affect us. Others impressed us with the artistic direction of a campaign, or by a brand’s deviation from industry norms. And, some marketing moments left us awestruck by how offensive an ad came off, or at how big a mistake a major brand ended up making. H&M gets accused of racism — again. Weight Watchers picks up DJ Khaled. As a brand, Snapchat wants to stay “hip” and popular with younger populations for as long as possible. That often means extending creative liberties to their marketing and advertising team. This allows them to use edgy humor and questionable direction to produce ads in the name of standing out. But this spring, they went a little too far. The premise of its campaign was a “would you rather”-style game, which was innocent enough, until they ran an ad that asked users if they would rather “slap Rihanna” or “punch Chris Brown.” Needless to say, Rihanna, her fans, and most of the general public were not amused that the company would make light of domestic abuse. Eventually, Snapchat apologized and tried to excuse the matter by stating the ad was published by mistake, but it couldn’t make up for the damage. LinkedIn was never the top competitor in the social media world, and over the past few years, it seems like it’s become even less relevant despite maintaining an impressive user base. This year, LinkedIn made a fantastic attempt to revitalize its brand and dismantle the stereotype that it’s a platform exclusively for white-collar workers. Starting with a TV spot titled “In It Together,” LinkedIn began showcasing a wide range of different professionals in tons of different businesses — and in dozens of different formats — including online videos, digital displays, social media ads, podcasts and radio spots. It’s a bold move for LinkedIn, and one that’s getting them a lot of new attention from demographics they previously passed over. 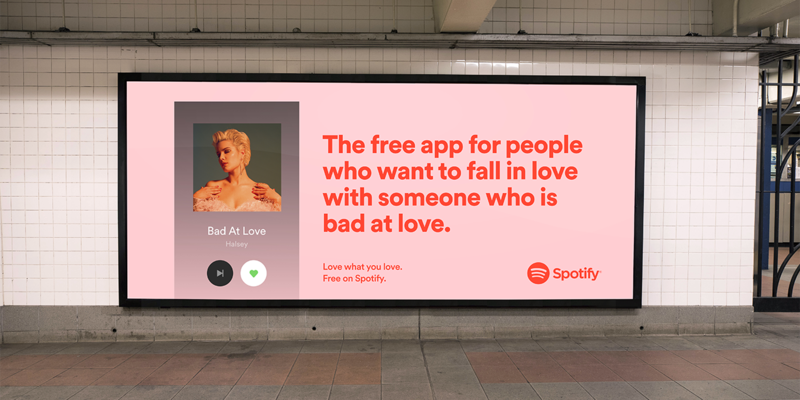 Spotify’s marketing team is usually pretty quiet, but at the turn of the new year, they decided to get a little edgier — all while staying true to their audiences. The thing is, everyone loves music, so Spotify had to customize their campaign to cater to hyper-local populations in pockets all over the United States. So, they dug up some facts about user listening habits and turned them into some risky, witty humor they then featured on billboards and other outdoor ads. Unfortunately, some companies publish ads or marketing materials that could be interpreted as racist, or those that unintentionally reinforce stereotypes. But most companies that experience the waves of criticism and anger from their customers end up learning from their mistakes. This was not the case for H&M, which has been criticized for a lack of diversity, and questionable ads in the past. This year, they added more fuel to the fire by featuring a black child with a hoodie in one of their ads — a hoodie labeled with the phrase “Coolest Monkey in the Jungle.” Despite some defenders, the company faced some deserved blowback. H&M hired a diversity manager to (hopefully) prevent this kind of thing from happening again. Brands often turn to influencer marketing, picking up the approval, participation, or recommendation of various celebrities to promote their products and services. And it’s typically easy to imagine these people engaging with the brand. For example, it’s not a surprise when a professional athlete is picked up by a sports apparel brand. That’s why it was so surprising when Weight Watchers picked up DJ Khaled as a spokesman this year. DJ Khaled, by no measure, represents or appeals to the stereotypical Weight Watchers audience, but that was the point: They picked him up to show that Weight Watchers is for everyone, including men and young people, and they succeeded in their efforts. So what are the biggest takeaways from these surprising marketing moments? Sometimes, a cheeky, edgy joke can make your brand look cool, as was the case with Spotify. Sometimes, you go too far and your audience will hold you accountable for your tastelessness, as Snapchat’s did. Double-check your tone, and be mindful of how people may interpret your messages. The better you know your audience, the more you can appeal to them. LinkedIn and Spotify, in particular, found great success with their surprising strategies because they targeted specific audiences with data-based insights and representation. Integrated marketing campaigns were big this year, and they’re going to be big next year. Don’t be afraid to branch out to new marketing and advertising channels; it may be the move you need to reach an audience segment that was previously unattainable. Creativity and surprise can be beneficial to a brand that plays its cards right. Look for inspiration in unlikely places, including influencers, audience segments, or referral sources you might not have previously considered. Surprise isn’t necessarily a good or bad thing in marketing. After all, you have to take risks if you want to stand out from your competition. The important thing is that you take the time to learn from the surprising marketing moments of other brands, whether it inspires you to come up with some ingenious campaign of your own, or cautions you to do your homework before making a contentious statement.